LeanWX NYC is the premiere worldwide forum for professionals interested in all aspects of organizational design including LeanUX, Design Thinking, and Lean Systems Thinking. The conference features work on the design of complex systems including organizations, teams, business models, and markets; the structure of communication between humans mediated by technology; and modalities of praxis and contexts of use for interactive systems, process improvement, designed artifacts and experiences. 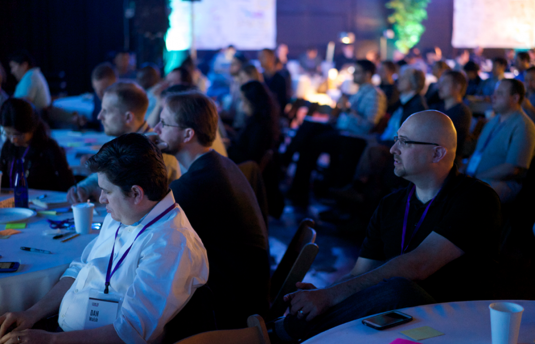 LeanWX NYC 2015 was a five-day, single-track conference (Wednesday through Sunday). The conference incorporated short format 20 minute talks, keynotes, Lean Coffee, and open spaces and was organized around presentations, great food (including macaroons flown in from France), and discussions on how organizations can adopt LeanUX, Design Thinking, DevOps, and Kanban in their organizations. The first three days of the conference was single-track so that all attendees and speakers could have a shared experience. Days four and five included facilitated discussions, open spaces, and keynote talks.